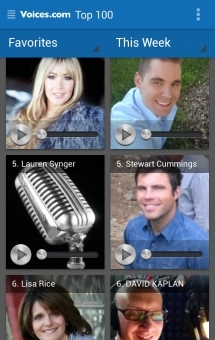 Find Voice Talent Using New BlackBerry 10 App | BlackBerry Blast! Need a voice for that? Last week, London-based voice-over marketplace Voices.com released a mobile app for BlackBerry 10 users. The company connects businesses with voice actors around the world, making it easier than ever before to find the perfect voice on time and within budget. Voices' BlackBerry 10 app was developed shortly after the company launched its app for Android in mid-January 2013, complementing Voices' apps for iOS devices such as iPhone, iPad and iPod Touch. Within less than a year, Voices has rolled out apps for all major mobile devices, going from strength to strength in innovation and excellence. With the official Voices.com BlackBerry app, users can tap into a network of over 75,000 voice-over talent from around the world to find the perfect voice for audio projects of any duration or complexity. Voices.com's app for Blackberry lets its users browse the Top 100 voices or search Voices' global network of voice actors by keyword, language, gender, location and specialty. Users can also visit talent profiles and listen to voice-over samples, learn more about a voice-over professional and view their feedback ratings and reviews. David Ciccarelli, Voices CEO, shares, "We're delighted to provide an app specifically for BlackBerry 10. As a company based located just an hour or so away from BlackBerry's hometown, we're pleased to add value to people using BlackBerry 10 devices internationally and in our own backyard." One of the key benefits of the Voices.com BlackBerry 10 app is that client users can post a job outlining their needs and receive talent responses within the hour. Responses are reviewed within a user's account, consolidating important information such as how a talent sounds reading from the client's script, proposals and price quotes. Creating a short list of talent a client might work with is as simple as clicking the "Like" button associated with each audition. Awarding a job, approving audio and releasing funds to pay voice talent can all be done conveniently from the Voices.com App for BlackBerry 10.